Does your child absolutely love looking outside the window and recording the weather each day? Or is she especially curious about how the clouds make rain or why it snows? If so, you may want to check out a new children's book by Fox News Channel forecaster Janice Dean, aka the "Weather Machine!" Freddy the Frogcaster tells the story of a young frog with a talent for frogcasting (get it), and how he helps save the town picnic by being prepared. Freddy's curiosity (about weather) creates an incredible opportunity when the town's new "frogcaster," Polly Woggins, needs his help in the Frog News Network weather room. Freddy's inquisitive nature and optimistic spirit help him save the annual picnic and earn the respect of his entire town. Mary and I both enjoy this entertaining and educational book! So much great science! The illustrations are fun and super-cute, and Freddy makes good choices as he goes through his weather adventure. My favorite part is after the story, when Freddy explains all the weather terms in everyday language; this is very helpful and will be perfect when Classical Conversations Cycle 1 rolls back around! However, weather really is an all-the-time subject, so why wait for Cycle 1 to start learning about high and low pressure systems and cold fronts? The only thing that's kind of 'eh,' is in Freddy's talk about snow in the final pages. He says, "Each tiny flake is a piece of nature's artwork." Well, you know what I'm going to say, right? As a Christian, I do not believe nature has artwork; I believe nature is God's artwork. However, is this a deal-breaker for Freddy? Nope, not for us. Instead, I use statements like these as opportunities to talk about our faith. 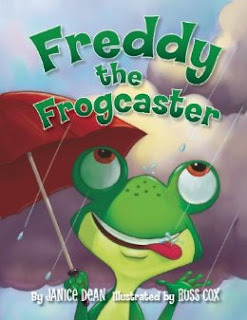 So, if you're looking for a fun weather book that will teach while it entertains, give Freddy the Frogcaster a try! Mary has read it several times and really loves it; your child might enjoy it, too! I was given a free copy of this book in exchange for an honest review. We really do enjoy the book; I will never, ever, ever, ever, review something untruthfully. Period. Thanks for taking the time to read the small print!